"I…wish Saïd Sayrafiezadeh had a surname that is simpler to pronounce. (Try this: say-RAH-fee-ZAH-day.) Because it’s one that you may want to remember and be able to speak aloud, if this exacting and finely made first book is any indication." 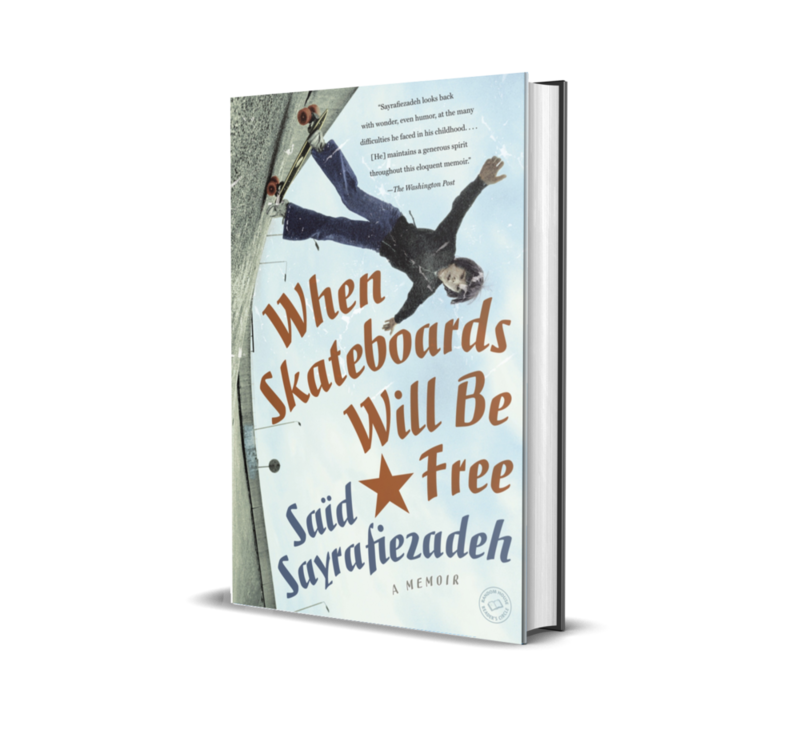 ""When Skateboards Will Be Free [is] heartbreaking and hilarious, sometimes both at once…"
"Sayrafiezadeh’s excellent memoir displays a sophistication and keen intelligence that allows him to walk the line between pain and humor without even seeming mawkish or cheaply cynical." "…intelligent, funny, utterly unsmug and unpreening. The book compellingly depicts the Orwellian truth about how childhood can be a world where it's impossible to be good, a realm in which Sayrafiezadeh is often aware that whatever thought he's thinking is the wrong thought to be having." "achingly truthful… not a pat tale of redemption but an adult's honest reckoning with his peculiar American childhood." "…fascinating, maddening and, at times, comic… brims with so many opposing loyalties and deep ironies." "Sayrafiezadeh maintains his generous spirit throughout this eloquent memoir." "When Skateboards Will Be Free is a brave, honest and elegant book. It felt like the story was being whispered in my ear. I haven’t read a memoir in quite a while that has so skillfully made sense of an American childhood." "Sayrafiezadeh's experience shows us more than just the tired rhetoric of the Socialist Workers Party — it reveals how hard it is for any of us to see the boundaries of the ideology we inherit." "When Skateboards Will Be Free is a deadpan-hilarious account, deceptively dispassionate in tone and often heartbreaking in its coolness and directness." "…a poignant reminder that, for all the romantic visions of childhood as a time of fantasy, it’s often children who are forced to deal with the real-world implications of the stories adults choose to live by." "With spare, beautiful language and an impeccable ear for telling juxtapositions, Sayrafiezadeh turns familiar American scenes — playing football with schoolmates, watching Walter Cronkite on television, working as a grocery bagger — into minefields of political meaning.… Sayrafiezadeh is a born writer, and providentially, he’s been given an amazing story to tell." "What sets When Skateboards Will Be Free apart from other broken home memoirs is Sayrafiezadeh’s story of his struggle to parse the deeply ingrained Socialist Workers Party politics from his personal psychology…"
"function[s] as both personal narrative and generational statement…"
"[Sayrafiezadeh] uses his considerable writing talent to reveal how ideology seeps not only into the logistics and protocols of our lives, but also into the marrow of our characters." "Sad, angry, hilarious, heartbreaking, and brave — When Skateboards Will Be Free does everything a fine memoir should, and more. That Saïd Sayrafiezadeh survived his childhood in one piece would be triumph enough, but this beautiful book expands that personal triumph into art. It belongs on the shelf next to the best modern memoirs." "[Sayrafiezadeh] writes with grace and clarity about growing up juggling deprivation and desire." "Said Sayrafiezadeh has a wry, deadpan sense of humor, an exceptionally open heart, and the wisdom of a true outsider. When Skateboards Will Be Free shows us exactly how he came into possession of these qualities. This is a fantastic, beautifully written memoir." "The poignant, brilliantly told story of a unique and troubled childhood… An enormously talented writer, Sayrafiezadeh ably conveys a complex blend of affection and anger toward his deeply flawed parents in deftly controlled prose. An excellent memoir. Sayrafiezadeh is a writer to watch." "Once I began it, I couldn't put it down but to sleep. So rending a memoir, it reaches the reader's innermost consciousness. Its language has the fierceness and humor of a Charles Dickens story about childhood." "Do not pity Sayrafiezadeh his childhood of deprivation — wonder at his ability to transform poverty into comedy and genuine suffering into joy." "When Skateboards Will Be Free is fraught and funny and haunting. Sayrafiezadeh never flinches, but neither does he stint on compassion. A wonderful recounting of a childhood, this book is also a powerful exploration of how belief binds families, and tears them apart." "Sayrafiezadeh's memoir is lucid, heartbreaking, finally uplifting. This is a jail-break of a book. I loved it." "…the author tells his coming-of-age story with a witty awareness for a childhood of personal and political contradictions and a touching regard for a childhood materially deprived…"
"This is a remarkable memoir of a fragmented childhood." "…an affecting, witty reflection on the complex forms of love in a revolutionary family." "The blend of socially conscious rhetoric with the sorrow and farce of daily detail is haunting, as true to the child’s viewpoint as to that of the wry successful American adult looking back now — from his dream job working for Martha Stewart. A memoir full of surprises."